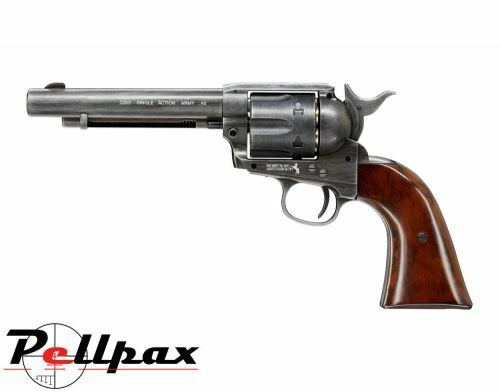 This Peacemaker replica from Umarex has been a massive hit since it was released in 2015, and now it is available to fire .177 pellets for even better accuracy than before. The pistol's frame, as well as the key moving components such as the cylinder, trigger, and hammer are all made from metal which resists wear over time, and gives the pistol a very heavy weight for a super realistic shooting experience. All the moving parts are also very well finished to ensure that operation is smooth and precise on each shot. Behind the plastic grips which are finished in a realistic wood pattern the Co2 capsule is concelead, and it is tightened and loosened by means of an allen key incorporated into one of the grips so you are never left without the correct tools.